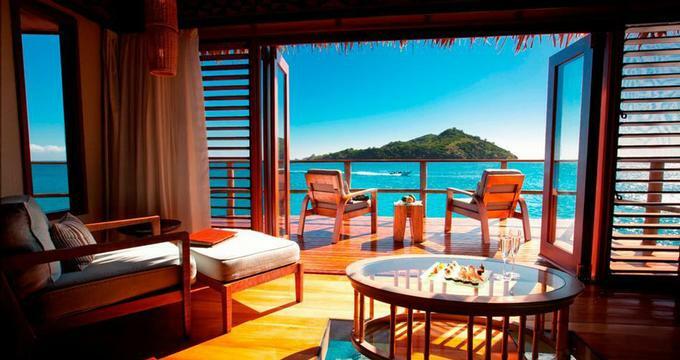 Here are 24 most amazing ocean views you don't have to get out of bed to see. 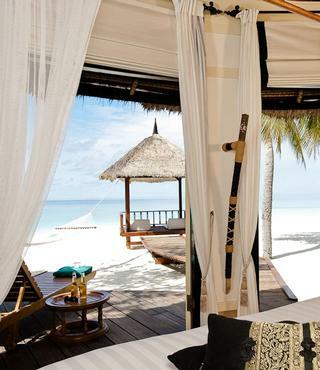 Whether you want a bedroom on the edge of the ocean on a calm sandy beach, a bungalow over the water, or a bed on a cliff with views of the horizon, here are the top choices great choices to inspire your next getaway. 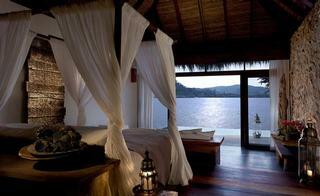 Open your eyes in the morning to this amazing view of the blue lagoon at Likuliku in Fiji. The bure has glass floors so that you can see tropical fish right underneath you. There are stairs that lead into the lagoon for a refreshing swim. This unique Underwater Suite at the Conrad Maldives is only available on special occasions (it's usually an underwater restaurant). But if you manage to book this exclusive abode, get ready for a night to remember. 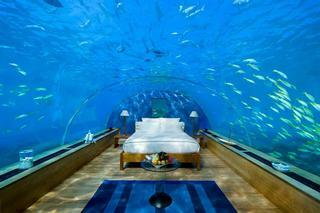 The acrylic tube gives you 180 degree views of the spectacular underwater world in the Maldives. 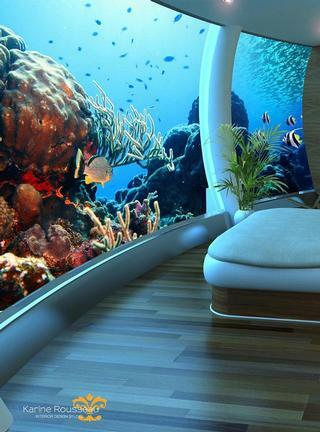 The world's first undersea resort is already under construction in Fiji. Once completed, views from its guest suites, restaurant and spa will be unlike any other in the world. 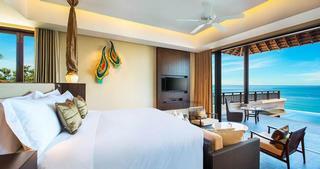 The Deluxe Beachfront Villa Bedroom at Banyan Tree Vabbinfaru is just steps from the calm ocean's edge, a beach dining gazebo and a hammock with spectacular scenery. The Residence at the W Koh Samui is elevated above the water to give you the most spectacular views of the horizon where the ocean and the sky meet. 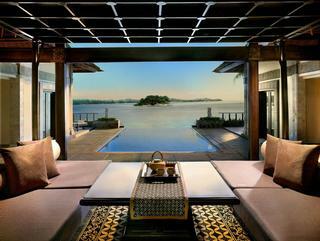 The One-bedroom Banyan Pool Villa at the Banyan Tree Bintan Bali offers open water views from its spectacular outdoor pool deck where you can spend your days getting massages, sunbathing and enjoying romantic dinners on your honeymoon. 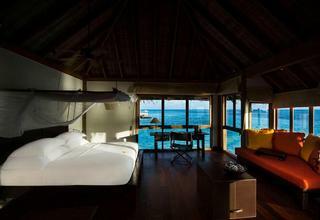 At Coco Bodu Hithi Maldives every view is focused on the water, including this cleverly positioned room on stilts over the water. You can see the pool on the left side of the wooden outdoor deck. 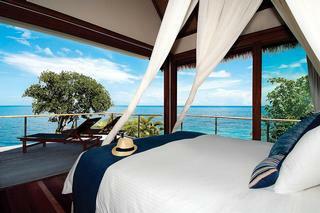 Fantastic blue scenery greets in the morning at the Royal Davui, an intimate Fijian hideaway with just 16 villas. 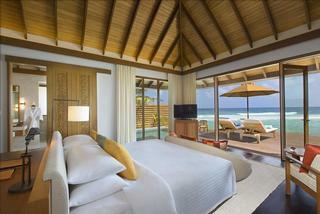 The Ocean Pool Bungalow at Anantara Veli Resort in the Maldives offers uninterrupted views of the horizon. 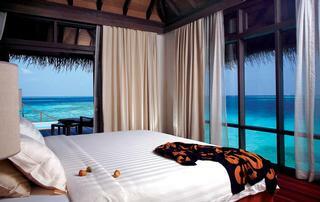 Watch rolling waves from your plush mattress and jump in the pool or right into the water whenever you please. 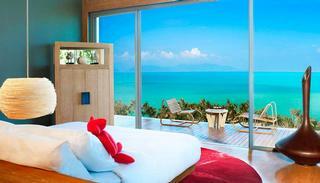 Banyan Tree Samui is a romantic getaway for couples in Thailand. 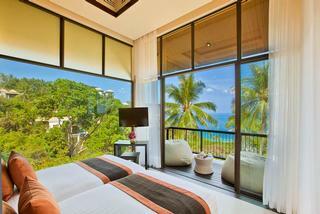 Bedrooms are elevated above the sandy beach and offer great views of the water and the lush gardens. 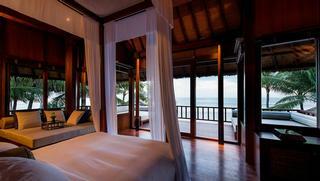 This bed is steps from an infinity edge pool that hangs over a cliff above the sea. 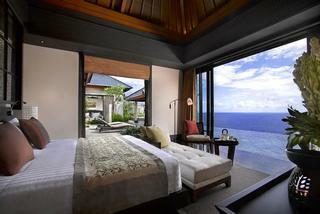 This photo shows a Bali Cliff Edge Ocean Villa at Banyan Tree Ungasan. Capri, Italy, is famous for the spectacular views from its cliffs. 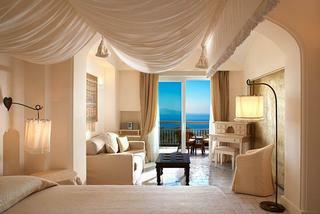 This spacious Deluxe Sea View Room at at Capri Palace Hotel has a separate sitting area and a terrace over the cliff. 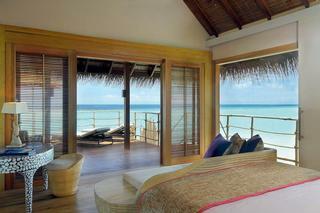 Constance Moofushi Maldives offers beautiful bedrooms built on stilts. 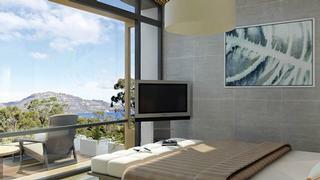 In the morning, open your eyes to a stunning view of the blue lagoon. Couples Tower Isle in Jamaica offers romantic bedrooms with terraces overlooking the water. All-inclusive pricing makes this resort popular with honeymooners. Dark woods contrast with the bright blue of the water and the sky at in the unique Crusoe Bedroom at Gili Lankanfushi Maldives. Romantic touches, elegant design with high ceilings and a generous layout make the Overwater Villa at Hilton Bora Bora Nui a great choice for couples and honeymooners. 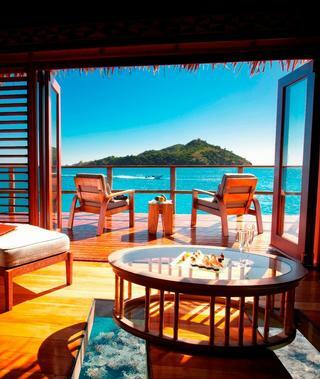 Glass floors in the Premium Over water Bungalow at Le Meridien Bora Bora make you feel one with the water from the moment you open your eyes to the moment you close them in the evening. Step on the huge glass panels and see the marine life underneath the bungalow. The master bedroom at the The Legian Bali Beach House offers an open-air design with oversized sofas from which you can enjoy uninterrupted ocean views. 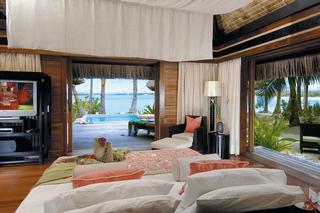 This awesome bedroom at Necker Island overlooks the clear Caribbean Sea and the abundant coral reef. The spacious deck has a plush lounger and a table for a breakfast in paradise. Saffire Freycinet overlooks Tasmania's scenic coast. The spacious deck outside is the perfect place to relax and enjoy the view. This romantic four poster bed at Songsaa offers incredible views of the private infinity-edge pool and the Gulf of Thailand. 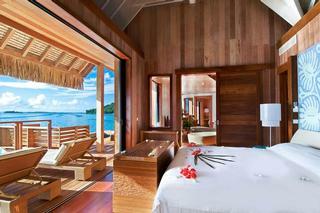 Giant sliding doors open out to the beautiful surrounding nature at the St. Regis Bora Bora. A spacious deck with a private pool is an idyllic spot for relaxation and rejuvenation. 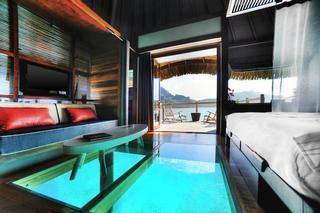 This photo of the Grand Pool Suite at Vana Belle Koh Samui makes you long for a relaxing tropical holiday. 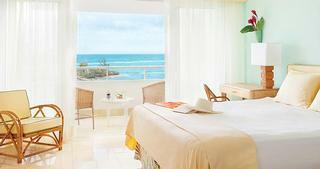 The suite has slick modern amenities and incredible ocean views. Next Read: Best Secluded Romantic Getaways. 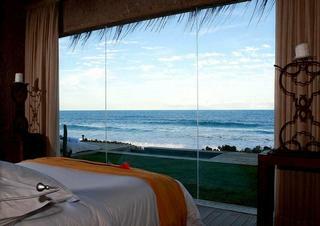 Kenoa Resort in Brazil will put you so close to the ocean that you'll literally feel part of it. Huge floor-to-ceiling windows separate a cozy mattress from the elements and dramatic scenery.